Situated about seven miles to the South of Kendal, Preston Patrick is a dispersed area of small hamlets and farms, and one of the older parishes in the South Lakes area. The area’s history dates back to the 12th century when Thomas de Wyrkington founded an abbey of Premonstratensian canons between today’s Preston Patrick and Holme. The site was eventually abandoned in favour of Shap Abbey. The name “Preston Patrick” is derived from “Priest’s town” or “Priest’s farm”, and from Patrick de Curwen, an earlier owner of the manorial area. Above. 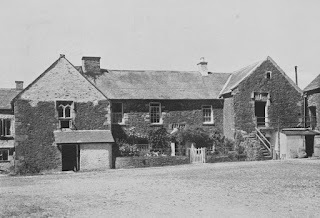 Old photo of the hall. After the dissolution of the monasteries, during the reign of Henry VIII, Thomas Preston, the then holder of the manor of Preston Patrick, purchased Furness Abbey from the crown, this purchase also including vast tracts of lands. He then quit Preston Patrick Hall in favour of the more comfortable lodgings at the abbey. From this time on, he made sure that the family name was altered slightly, so that in documentation, any Preston was to be known as a Preston of the Manor and the Abbey. No doubt a show of wealth and familial significance. In the 16th century, the hall and the manor passed to John Preston of Preston Richard and Nether Levens Hall, by way of marriage to Ellyn Curwen. The hall as it is to be seen today was largely built in the late 14th century. It resembles Selside Hall near Kendal, with its twin wings, each of two storeys, and large connecting central hall. 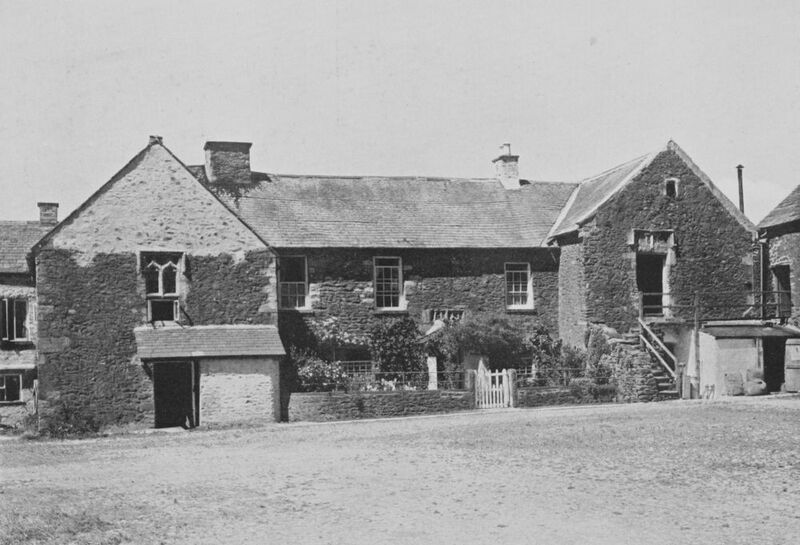 Indeed, both wings, front and back, and an element of the extension to the left of the building are all dated to the late 14th century, with elements of both the ground floor and the first floor of the central hall also dating from this period. The central hall contains elements of some rebuilding work from the late 15th and early 16th centuries, as well some further rebuilding and redesign from the 17th century. The hall block was probably heightened during this latter period of rebuilding, and remains open right the way to the roof timbers. Above. 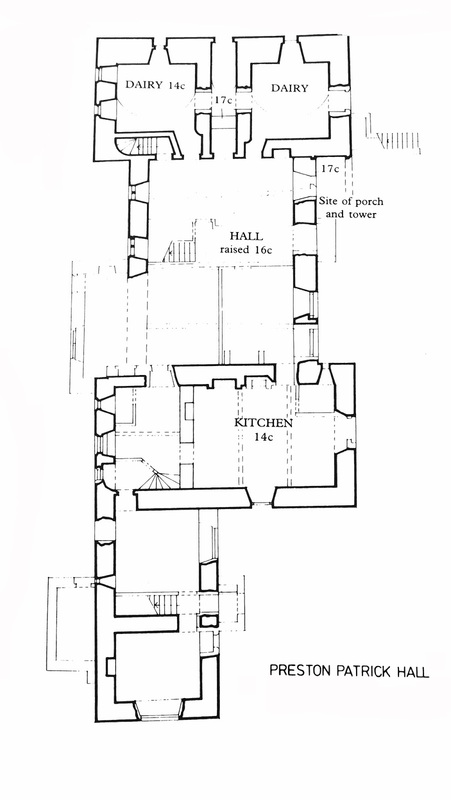 Floor plan of Preston Patrick Hall. The basement in the right hand tower is vaulted, whilst the basement in the left tower is joisted. Whether this indicates two periods of building is unclear, but could just mean that the left tower was repaired at a later date using newer building methods. Above. Machel's sketch of Preston Patrick Hall. The right hand tower contains a room once used as a manorial courtroom on the first floor. 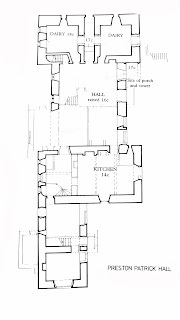 This room is entered through a doorway at the top of a later flight of stairs, which clearly was once a window. The sandstone heads still remain in place. The courtroom was used to pass judgments on local Quaker preachers when the breakaway religion was first finding its feet. When the hall was being altered, a hidden staircase was discovered built into the wall, linking the house to the courtroom. Some documentary evidence seems to suggest that the site was surrounded by a curtain wall, and that there was also an additional tower.